Special Olympics USA • 60 Day out Announcement! There is a new Addition to the Team! 60 Day out Announcement! There is a new Addition to the Team! In celebration of this exciting milestone, Special Olympics USA would like to welcome a new addition to the team. Joining SO USA on the journey to Abu Dhabi is Special Olympics Illinois athlete Daniel “PodmanDan” Smrokowski. Unlike other athletes traveling with the delegation, Dan will not be competing. Instead, Dan will be participating as a recently appointed Sargent Shriver International Global Messenger, and the newest member of the Special Olympics USA Communications Team. 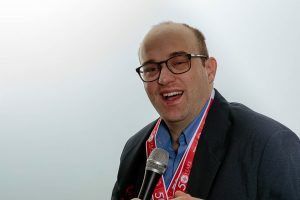 As a part of the team, Daniel will contribute to the storytelling of more than 200 American Special Olympics athletes as they prepare for World Games and compete go for the gold in Abu Dhabi and Dubai. Dan is best known for his Special Chronicles podcast series where he reaches more than 127,000 people globally. In addition to being the founder of Special Chronicles, Dan is an active Special Olympics Illinois athlete.